The SV3C Personalized SerDes Tester is an ultra-portable, high-performance instrument that creates a new category of tool for high-speed digital product engineering teams. It integrates multiple technologies in order to enable the self-contained test and measurement of complex SerDes interfaces such as PCI Express Gen 3, USB3, MIPI M-PHY, DDR3, and DDR Controllers. The SV3C fits in one hand and contains 32 independent stimulus generation ports, 32 independent capture and measurement ports, and offers world-class signal-integrity features such as jitter injection and jitter measurement. 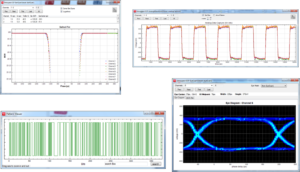 Coupled with a seamless, easy-to-use development environment, this tool enables product engineers with widely varying skill sets to efficiently work with and develop SerDes verification algorithms.